The Elizabethan era brought the Renaissance, new thinking to England. 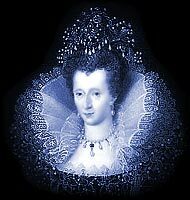 Elizabethan women from wealthy and noble families were sometimes allowed the privilege of an. Education. The girls of Noble birth were invariably taught by tutors at home and Elizabethan women were taught from the age of five, or even younger. Various languages were taught including Latin, Italian, Greek and French. Music and dancing skills were essential for Elizabethan women. Elizabethan women were not allowed to go to university. The Elizabethan women who were commoners would not have attended school or received any formal type of education. Elizabethan women would have had to learn how to govern a household and become skilled in all housewifely duties. Her education would have been purely of the domestic nature in preparation for the only real career option for a girl - marriage! Single Elizabethan women were sometimes looked upon with suspicion. It was often the single women who were thought to be witches by their neighbours. All Elizabethan women would be expected to marry, and would be dependant on her male relatives throughout her life. At one time single women might spend their life in a convent or nunnery but due to the dissolution of the monasteries this was no longer an option. The only alternative to marriage for Elizabethan women from the lower classes was therefore domestic service. The married state was seen as highly desirable by all women of the lower classes. With parental permission it was legal for Elizabethan girls to marry at 12 although it was not usual for marriages at such young ages. Elizabethan women were expected to bring a dowry to the marriage. A dowry was an amount of money, goods, and property that the bride would bring to the marriage. It was also referred to as her marriage portion. After marriage Elizabethan women were expected to run the households and provide children. Large families were the norm as the mortality rate for children and babies was so high. Many Elizabethan woman made arrangement for the care of their children in case they themselves died during childbirth. "Women in her greatest perfection was made to serve and obey man." Elizabethan Woman were totally dominated by the male members of their family. They were expected to instantly obey not only their father but also their brothers and any other male members of the family. The punishment for disobey was the whipping stool - the Elizabethan girls were beaten into submission and disobedience was seen as a crime against their religion. Elizabethan Women could not be heirs to their father's titles. All titles would pass from father to son or brother to brother, depending on the circumstances. The only exception was the monarchy.